(1) Cream butter and sugar till creamy. Add egg one at a time till batter is smooth and light. (2) Fold in flour, salt and baking powder with a spatula until well combined. Then add in orange juice, orange zest and toasted hazelnuts. (3) Pour batter into 7" to 8" heart shape pan and bake at 175C for about 45 mins. or till cooked. 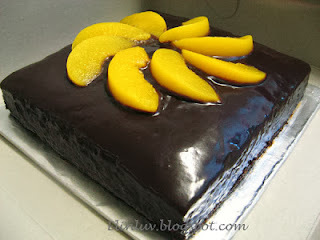 (4) Cool the cake on cooling rack till completely cooled. (5) Pour Ganache on top and place some white chocolate shavings on top. Chill in the fridge till ganache sets. Note: For Ganache, double-boil whipping cream then pour onto chocolate and stir till smooth. Add in butter and stir till well combined. The Ultimate Look For Me?